The picturesque town of Morro Bay lies in the middle of a particularly scenic stretch of the central California coastline, within 12 miles of four state parks, newest being Harmony Headlands State Park, created in 2003. The preserve occupies 784 acres of empty land between the coast and Hwy 1, which for several miles runs out of sight of the Pacific, hidden from view by a range of rounded, grassy hills. 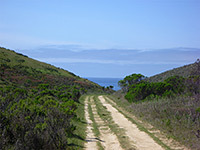 This land used to belong to a cattle ranch, and the hills north and south remain in private ownership, part of a ten mile section of the coast that is otherwise closed to the public and not visible from the highway, and is appealing because of its remoteness and natural condition - apart from an old vehicle track, now used as a foot trail to reach the shore, there are no other signs of development. 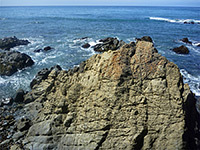 The shoreline itself is typical of this region of California, bordered by low, eroded sandstone cliffs that shelter small sandy coves, tidepools and numerous offshore rocks, above which rise treeless, grass-covered hills bearing a good selection of wildflowers in spring and summer. 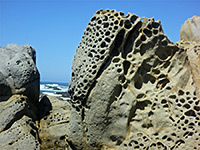 The sandstone is nicely colored in a range of shades of grey and orange, and has the added attraction of unusual, potmarked weathering of the surface of some of the rocks, an effect known as tafoni. Although new, not well signposted and lacking any facilities, the state park is relatively popular, seeing dozens of visitors on a typical summer's day. 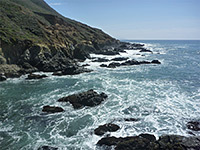 The place is somewhat reminiscent of the Lost Coast of north California, though its remoteness is on a much smaller scale. 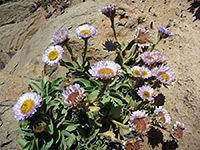 The sole entry point to Harmony Headlands State Park is on the west side of CA 1, 12 miles north of Morro Bay (8 miles south of Cambria), at a small trailhead with space for only about a dozen vehicles, though more parking is available on the far side of the highway. Two tracks lead towards the hills, one to a working ranch that adjoins the park to the south, and the other to the coast, now used as a trail. This passes a gate, crosses the overgrown streambed of Ellysly Creek and runs along the floor of a shallow, grassy valley, mostly level apart from a gentle descent at the far end. 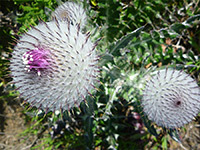 The hills at either side are unremarkable; smooth-sided, lacking any exposed rocks or patches of woodland, bearing such flowers as California poppies and lupine in spring. A rather excessive number of notices have been placed at closely spaced intervals, warning people not to leave the path 'in order to protect the environment and ensure visitor safety'. Features en route include a restroom after 0.4 miles, beside an old wooden bunk house, a seasonal pond after 0.7 miles and a fainter side track on the right after 1.4 miles, not for visitor use. The main path enters a short, narrower valley that contains a tiny creek, then opens out to grassy terraces above the ocean. 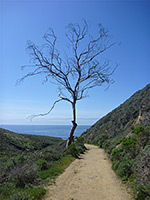 In the valley, a large, statuesque dead tree makes a good photographic subject; framed by the hillsides, with the Pacific beyond. The track continues northwest another third of a mile to the north edge of the state park, marked by a fence and more warning notices. This section of the shoreline is paralleled by a lesser path right along the cliff edge above the band of intricately eroded sandstone, which is colored black in the intertidal zone, grey around the high water mark and orange higher up. There are several places were climbing down to water level is possible, descending either to small sandy beaches, pebble banks or semi-submerged rocks with pools, all usually pounded by fierce waves. The lesser path ends in the south at the edge of the creek, but walking further is easy for a little way, along a much fainter trail, then more difficult because eroded ravines start to cut deeper into the hillside, which becomes steeper, so following the shoreline requires climbing quite high up, descending if desired to specific locations. Otherwise, all of the coast in the state park is similar, though the tafoni formations seem to be a bit more extensive further south. Seals are often in view, on rocks a little way out to sea, and the tide pools are home to other typical sea life including anemones and sea stars. The shoreline hereabouts certainly has a distinct feeling of isolation; a rare section of the central California coast without any nearby roads.